Video has been released from inside the officials’ meeting prior to the UCLA-Arizona Pac-12 tournament semifinal game. Footage includes intimidation tactics and the controversial comments made by Ed Rush that were later determined to have been made in jest. This footage is exclusive to PacHoops. This is likely not the man to have offered $5k cash or a trip to Cancun for actions against Sean Miller as reported by Jeff Goodman of CBS. No, the man recently investigated by the Pac-12, Ed T. Rush, is the Head of Officiating for the conference. Per Goodman’s source, he offered these rewards to any official who “rang him up” or “ran him” during the Pac-12 tournament. Him referring to Sean Miller. Oh my. OMGOMGOMGOMGOMGOMG. Wow. Whoa. Highlight-Control-C-Control-V-Gchat. Control-V-Tweet. Control-V-Personal-Book. Control-V-PacHoops-Book. Text. Text. Text. Text. Zero logical thought. OMGOMGOMGOMG. HEDIDTOUCHTHEBALL. I assume my actions generated less than 1% of the post’s total view. Stage 2: What’s this thing say exactly? So then I read the whole thing. 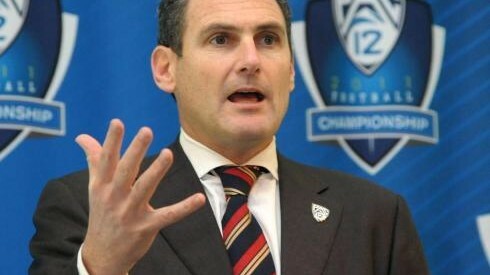 I learned that the Pac-12 “investigated” Head of Officiating, Ed T. Rush, and that an official anonymously made public comments made during this referees’ meeting. What was said was damning of an already poorly regarded officiating base, irresponsible for a man charged with upholding the integrity of sport, and threatened the sanctity of holding competitive athletics in Las Vegas (damn you!). “This,” I thought, “Is remarkably inappropriate and an obviously fireable offense. Ed T. Rush – because I have no beef with the neurofunk DJ – has no business in his current function. He clearly has a vendetta or grudge and an official’s office is no such place for those emotions to fester. What’s worse, what if there was a conspiracy to keep UCLA in the tournament? Emotion is one thing and excusable as human…but a SCANDAL! ARE WE LOOKING AT A SCANDAL?” Those were some of my thoughts. Stage 3: What was this thing really saying? So hold on, I think I needed to pause. Firing someone is a big deal and while I support just punishment, I’ve also come to learn that reactionary decisions are bad. Without this perspective I might have: No job, a child, debt, a graduate degree, things I can’t talk about because my mom might figure out how to use a computer this week, a piercing, more furniture off the street, JNCOs, an adult goatee, or an ASU fan. Stepping back I noticed that this was a bullied subordinate attacking a man who “we’re all afraid of” under the conditions of anonymity. Suddenly this screamed of tattle tale and finger pointing. What’s more, who hasn’t suggested something astronomically preposterous in a work meeting? I once listed – from my first kill to the last – who I’d take out should the office ever enter a Hunger Games situation. That, in retrospect, was not my best work. This, in retrospect, is not Ed T. Rush’s best work. If we’re to take the conference at it’s word, Rush’s comments were “in jest” and that everyone involved understood that these were “not serious offers.” No one wound up $5k richer. Michael Irving – the official who controversially T’d up Miller following this meeting – did not go to Cancun. An off the cuff remark that likely received chuckles was turned into a likely lucrative whistle blowing affair for one disgruntled man in stripes and jumped on by the media (understandably so). In what was either a small windowless room in the bowels of the MGM Grand Garden Event center or a glorious conference room in the same venue, Ed T. Rush made a remark about one of the coaches that had rode his officials season long. An under-appreciated and intimidated official went to the media with it under the protection of anonymity following what would no doubt appear action stemming from that off-handed remark. The conference called it a joke and had addressed its inappropriate nature with Rush. That’s the story we know. The fall out, of course, is where the intrigue lies. Who’s getting fired? What’s the conspiracy? How much money was really exchanged? Did he touch the ball? Can I party with Irving at Señor Frogs? Officiating is both thankless and a grind. These officials are pining for games, overworked, and maybe not always assigned games based on skill but rather preference. The sarcastic commentary of a tyrannical boss, regardless his or her intent, can be interpreted in many ways. As a manager, Rush should have known better than to make such a comment. Stepping out of our basketball bubble – or even our sports bubble – a manager’s role, particularly on the eve of performance, is to coach, empower, and educate. Doubt should not be instilled in the minds of the team, no matter whether it’s sales, dance, bartending, or computer programming. You’re a leader, be better than the surface pettiness. Back into our hoops bubble, these comments were made in the face of officials tasked with championing the law of sport. Now we do plenty of bitching at these men but we ultimately entrust them with the rules of the game. For the most part, they do a good job and are best appreciated when they are not seen. Well, Ed T. Rush and Larry Scott, you’ve got the spotlight on them. All eyes. And you dropped the ball. To dismiss this as a joke and that a couple conversations were had is unfathomably weak. I may be stepping into hyperbole but this is the very sanctity of sport. Rules – as we learned in kindergarten – are to be followed. If doubt creeps into the most basic and truest tenants of the game – that the rules must be followed – how do we trust any results? It’s now undeniable that the playing field was not level for Arizona (NOTE: THAT GAME WAS NOT LOST ON THAT CALL) regardless of Rush’s intent. For such, the spirit of competition deserves better than 191 inconsequential words of fluff. No. You nip this thing in the bud and you do not let it grow into the weed it could potentially become. It doesn’t matter what the investigation uncovered, this is bigger than whether Miller deserved a technical or not. This is the accountability of the stripes, the integrity of rules. Whether Irving’s actions were justified or not, Rush had planted this idea in his head. Inception, goes the dynamite. And regardless of Miller’s previous actions, leadership must be above such commentary in professional settings. Miller himself needs to be better than berating a Pac-12 employee in the halls. So what we have here is a crummy situation. A comment that did not cost Arizona a basketball game (stop Jordan Adams already) but did put an entire conference’s officiating integrity in the limelight. The last thing they possibly needed addressed in the least convincing of manners. What we needed was to believe that this was not sifting into the outcomes of the games which teams play to win, coaches coach to win, and fans cheer to win. To believe that these efforts are not for naught and that all participants can trust that the outcome was based off of the adherence and upholding of an established set of rules. To believe that when the final horn sounds, one team has prevailed over the other as the better of two competitors. Nothing else. Following Monday’s Pac-12 statement and inaction, I don’t know if I believe.